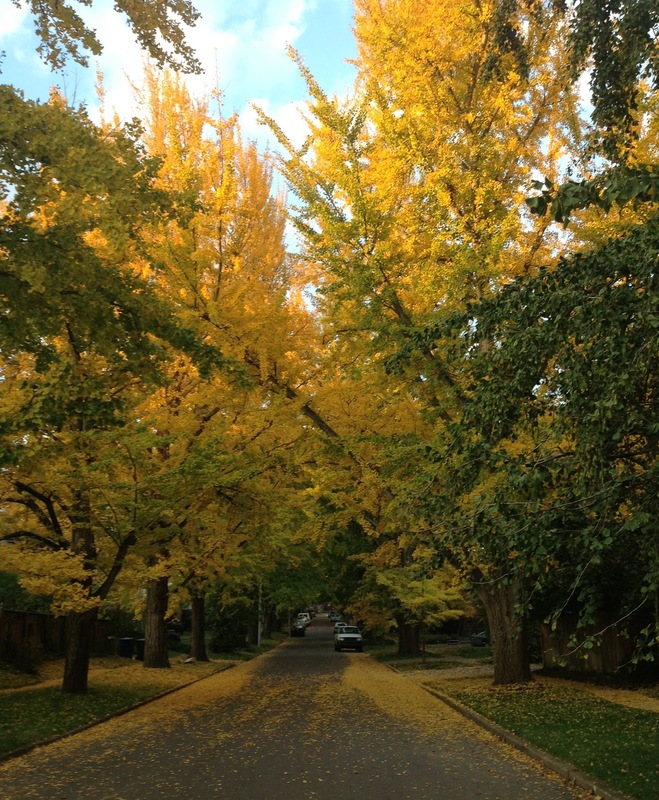 Every morning this week after my walk to Starbucks, I've walked over to this street and photographed the ginkgo trees. This is the prettiest street in Lexington this time of year. Expect an update next week although rain is forecast which could bring down all of the leaves. The ginkgo trees remind me of aspen. Besides taking pictures of ginkgo trees, I spent the week finishing up my obligations for the spring issue of Cast On. I wrote the pattern for the shawl, knit the socks, wrote the pattern for the socks, wrote the third article in the finishing series, knit samples for the Fashion Framework article on skirts and started the second pair of socks. I'm hoping to finish up the Fashion Framework article today. I will be completely ready for the photo shoot which isn't for a couple of weeks! What will I do with all that time...November birthdays are coming up not to mention my holiday knitting! It was a slow week. Again, it is like my students can see my calendar! The response to my gauge class has been pretty good, considering the topic which isn't exactly exciting. Important, yes. Exciting, no. The tip this week was a special request (yes, I do take requests) from one of the Co-chairs of the Masters Committee--how to begin a vertical seam. The focus of Level 2 is finishing. 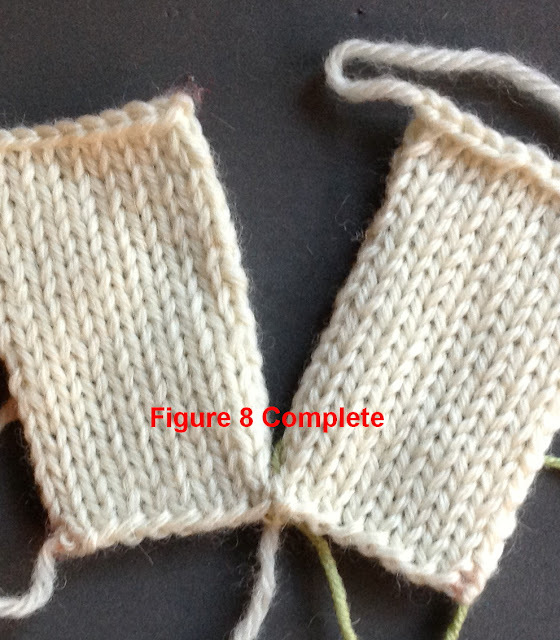 This is probably the toughest level for most knitters since most knitters hate finishing. The ironic thing about finishing is that if you know how to do it, it isn't all that bad. Sometimes I compare finishing to baking a cake. Yes, you can be a terrific baker. Your cakes may taste great but if they are lopsided and ugly it detracts from the cake. Finishing is like frosting the cake. It can make it exceptional. When you begin a vertical seam (think bottom of sweaters and sleeve cuffs) it is important that both sides line up exactly at the bottom. It looks sloppy when they don't. The photograph shows an example of a poorly started seam. 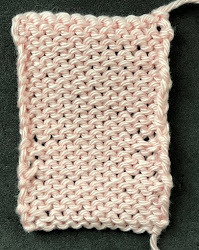 Several of the required swatches in Level 2 address vertical seams. One of the things the reviewer look for is if the pieces line up. Align the pieces RS facing, side-by-side, with the cast on edges at the bottom. Insert the needle from back to front through the cast on edge of the piece on the right. Insert the needle from the back to the front of the cast on edge of the piece on the left. 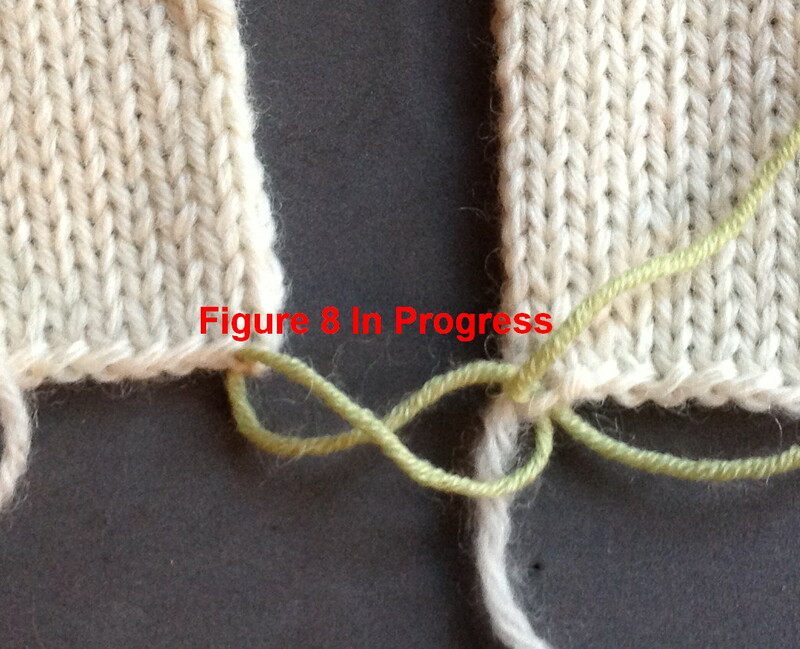 Complete the Figure 8 by inserting the needle from back to front into the same spot on the cast on edge. If you manipulate the yarn you can see that it forms a Figure 8. When this is pulled tight, it anchors the two sides together and it is invisible. I think the mistake many make is that they don't begin in the cast on edge. By the way, when I say "cast on edge" I mean the strand of yarn. 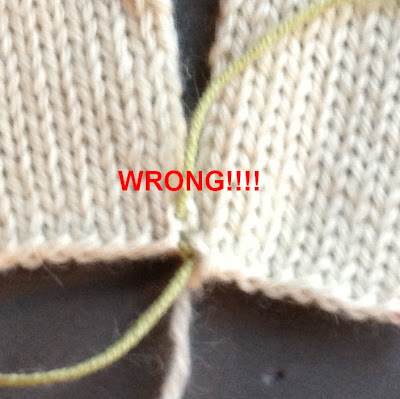 Don't split the yarn. There isn't a salon this week as I will be at the simulcast of the Met's production of Otello. This is the last week of the finishing class I am teaching at home. 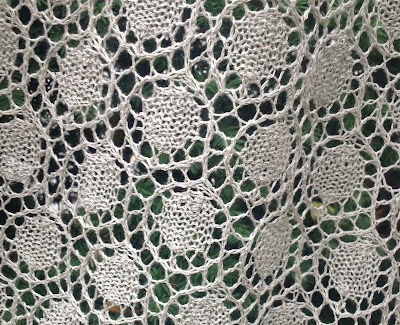 I have blocked the shawl and woven in the yarn tails. The pattern is really lovely. 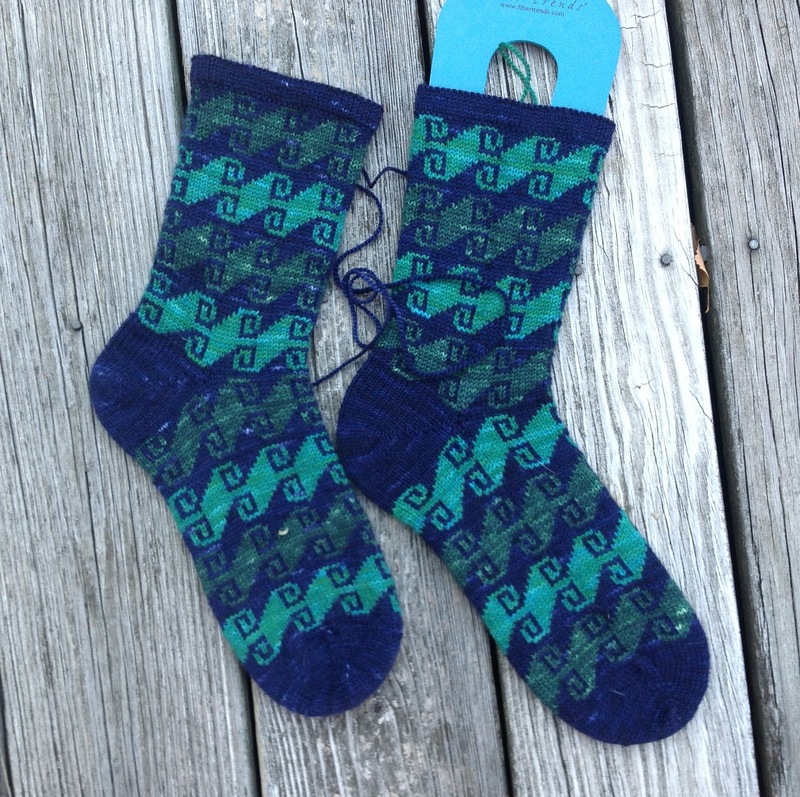 I finished the socks as well. I decided to call them Thalassa Socks. (What is the point of a degree in Classical Greek if you can't use it?) Thalassa is the word for sea. I think this design has a very Aegean feel to it. Sorry, Isabel, I can't call them the Green Wave! As I was knitting these, I realized that the color scheme I chose would require buying two packs of the yarn so I am going to knit up another pair with an alternate scheme which will use just one. Now that I have finished the samples of skirts for the skirt article I can do the socks. I decided to work up three skirts (gathered, straight and A-line) as illustrations. They would fit an 18" doll. They are blocking now so I will photograph them next week. I was going to do ribbing at the top but it wouldn't match the drape of the rest of the socks so I did a foldover hem. I grafted the hem using the same technique I used for the skirts. It really works well. The top is as stretchy as the rest of the sock. I got a nice surprise in the mail on Wednesday. 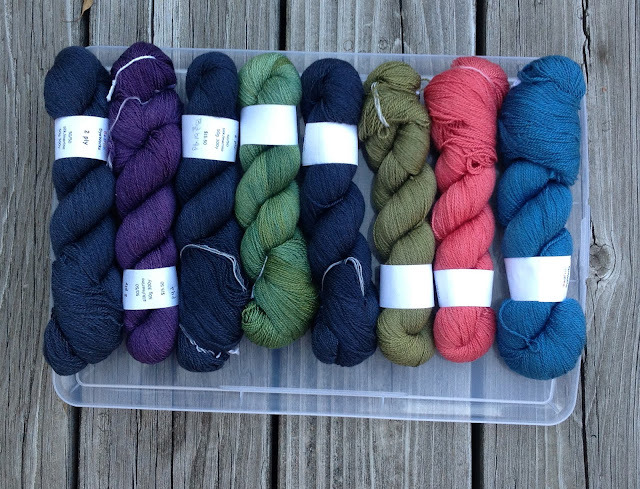 Elf and Sandy sent the yarn for the final sweater in the Utah series. I spent quite a bit of time with Elf in Reno selecting colors. She also sent some extra blues (not photographed) for me to play with. Swatching will commence soon. You really have to see the actual thing before you make final decisions. I am NOT looking forward to winding all of this into balls! 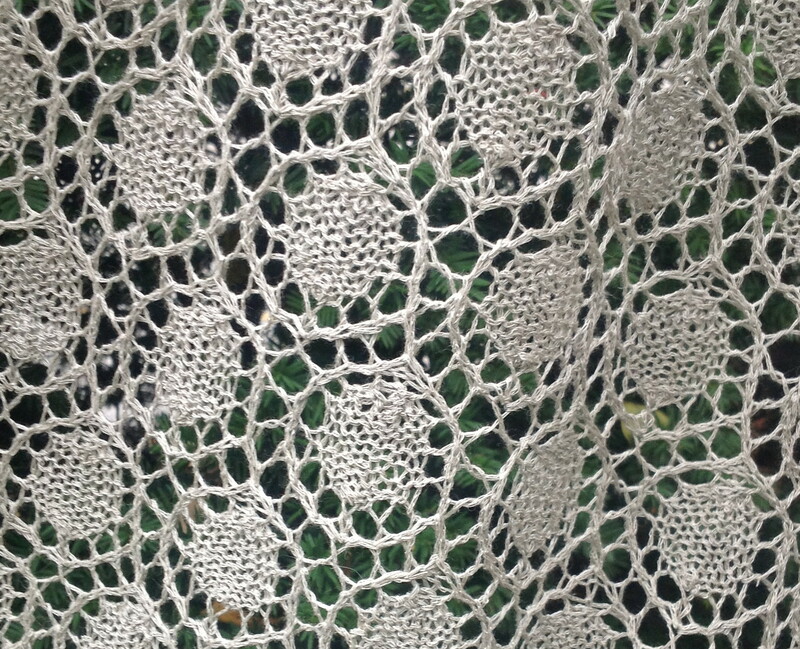 I think this will be a beautiful sweater. I'll post photos of the swatches as I do them. Labels: Figure 8. Beginning a seam. Finishing. The Thalassa Socks also hint at a Greek key design to I think that's a perfect name. And much more intriguing. They look like a fun knit.